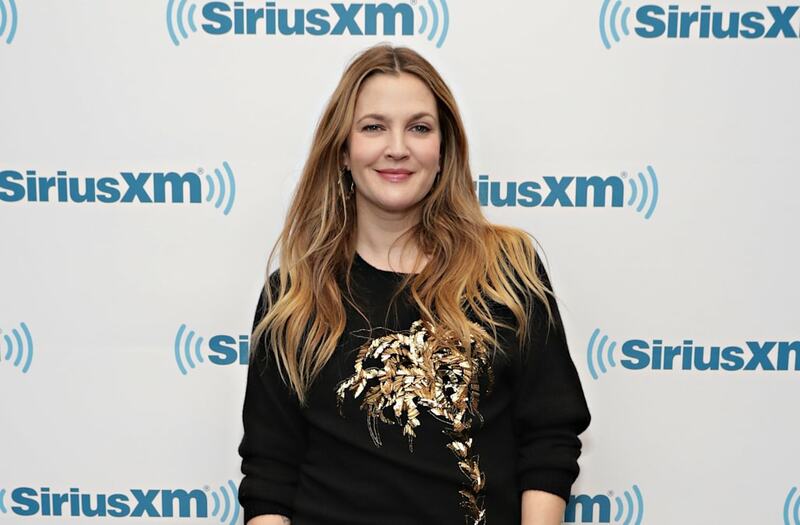 Drew Barrymore is feeling more confident than ever these days. The 41-year-old actress stopped by the Today show on Friday to promote her new Netflix show -- The Santa Clarita Diet -- with her co-star Timothy Olyphant, and shared she lost 20 pounds while filming. Barrymore plays Sheila in the show, who becomes a zombie after she dies. "It came in the middle of this moment in my life where I had let myself go due to personal circumstances," Barrymore shares. "And I thought I could come alive with Sheila. It was a really great goal line for me, because as much as the weight loss, everything's very subtle -- it's attitudinal, it's empowerment, it's confidence." "It's all of these things that she's lost in her life -- and I felt I had sort of lost in my life -- and it was such a blessing to come alive with her, and it really was so positive for me," she adds. Barrymore jokes that losing weight was a central part of playing Sheila. "If you're eating, in her case, human flesh, I basically thought, 'Well, if a woman was just eating simple protein every day all day long she would lose weight," the mother of two says with a smile. "It's, like, a very macabre Atkins [diet]." Barrymore is currently single after splitting from her ex-husband, art consultant Will Kopelman, last April. The pair have two daughters together, 4-year-old Olive and 2-year-old Frankie. In November, the actress acknowledged that 2016 was a difficult year for her. "I have cried a lot this year," she Instagrammed. "I have always been a person who is flawed. I forgive. I fight. But I do not fight with others. I will spend my life trying to give love. And I am always aware and appreciative when I receive it. My heart is very open right now." We're loving Drew's teddy bear purse and plaid dress. Stylin' in the '80s! 10-year-old Drew hangs out at the China Club, a since defunct New York City nightlife spot. We’re loving the pop of neon, but it looks like it might be past her bedtime! Drew's off-the-shoulder dress is just sassy enough but doesn't go too far, and we love it! Drew loves to rock a bold lip on the red carpet – looks like some things haven’t changed! Drew’s style typically leans towards casual. Here she is at a benefit in Los Angeles, wearing a denim jacket and blue-tinted shades. Drew got edgy for the 'Batman Forever' premiere in an icy blue mini dress and dark lipstick. We can definitely see the roots of Drew’s bohemian style here, at a movie premiere in Los Angeles. We also spy a much darker hair color! Drew is back to blonde and wears a deep purple satin dress to a celebration of Elizabeth Taylor's birthday. It’s pin curls and a modestly cut dress for Drew at the premiere of Ever After in Los Angeles. At the Kid’s Choice Awards in Los Angeles, Drew is able to really show off her bohemian flare with bell-bottom jeans, a long scarf, and a headband. Drew arrives at the L.A. premiere of "Charlie's Angels" with Tom Green on her arm. Drew looked cool and casual in all white for the 20th anniversary premiere of "E.T." Drew sports a black bikini under a white suit at the Charlie’s Angels 2: Full Throttle premiere. Drew loves a good retro hairstyle. We think this one, at a premiere of 50 First Dates, reminds us of Brigitte Bardot. Drew makes her entrance at the 77th Annual Academy Awards in her go-to red carpet color – black! This look, from the Costume Institute Gala at the Metropolitan Museum of Art, might be our favorite of Drew’s yet! A one-shoulder dress paired with a ponytail is the perfect party look for Drew. Drew shows up in a yellow frock to sign her first major beauty deal with CoverGirl. Drew arrives at the 64th Annual Golden Globe Awards in a pale pink stunner. At the HBO premiere of Grey Gardens, Drew is going for a major Priscilla Presley vibe. Drew attends the 16th Annual Screen Actors Guild Awards in a navy gown and, again a retro 'do. Drew vamps it up in gold for the Los Angeles premiere of Going the Distance. Drew goes yellow again for another CoverGirl event, and this time, we like the marigold hue even more than her last look. Drew goes for an allover print at the Big Miracle premiere in Washington, D.C.
We’re loving Drew’s take on pregnancy style, see here at the New York City Ballet’s Spring Gala. Here’s Drew at a Bvlgari event in Los Angeles. We love the jumpsuit and hot pink lip! Looking chic in all black with metallic accents, Drew attends a Refinery29 event. Drew wears floral for an interview at BUILD. At the Coach 75th Anniversary show, Drew sits front row in mixed prints. Drew attends the 2017 Glamour Women Of The Year Awards.